Yesterday, a small team from Ontarioghosts/PSICAN were happy to finally take advantage of an invitation someone sent in to us to visit a fine and fun historic home in Brampton. This historic site, owned by the City of Brampton and run completely by volunteers, has a history stretching back to 1819 when the first log cabin was erected on the land by John Silverthorne where the house now stands. That home is sadly no more, but in and around 1852, the first part of this outstanding Georgian house went up thanks to then owner, Peter Chisolm Sr. who eventually passed it down to his son, Peter Renwick Chisolm who, in turn, left it to his three children... none of whom lived in the home, but rented the property out. 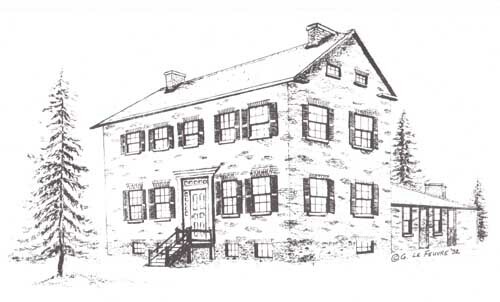 In 1929 it came into the ownership of James Bovaird who used the grounds to raise race horses... but again, he and his wife and eleven children did not live in the home, they also continued renting out the house until he James passed the home to his son, William, who was Reeve of Chinguacousy Township in the 1940's and a respected Roads Superintendent for 20 years. William and his wife, Mossie, loved the home and grounds and during the real estate boom years in the early and mid 1970's, when all the surrounding property was being turned into housing developments, they became determined to preserve their home and it's land for the future. With no children of their own, they decided they would donate the home to the City of Brampton to be maintained as a reminder of a bygone era. In 1985, then widowed Mossie Bovaird sold the home and surrounding properties for the princely sum of two dollars to the City on the understanding the home and grounds would be for everyone to enjoy... she never cashed the cheque. Over the next few years, the house went under extensive redecoration and refurbishment to present the wonderful historic site that's there to visit today. The home's decorations are (sadly) mostly not original to the home (this is common with most historic sites,) but the house is well appointed and laid out as one should expect most rooms... mostly in a late-nineteenth/early-twentieth century time period... with a charming display of toys and dolls in one of the bedrooms. Of course, there's a nice crafts shop available and a tea room for you to have a good cuppa in. The tale is of a piece of furnishing... a "haunted crib". Keeping in mind that these items are not original to the site, this child's bed is actually a donation to the house... made with the promise that no child or baby would ever sleep in it. The story goes that the crib was purchased by a grandmother for her daughter who was "expecting". After the baby came, the mother said she heard "gentle" noises coming from the baby's room (and specifically from the crib,) which, eventually, led to a "smokey" apparition of a woman being seen near the crib... almost tending to the baby. Now, the website (and hearsay) says that the mother, not truly feeling it was "evil" or "harmful", none the less sensed an impending danger from this visitor and all, so gave the crib away with the promise of no child sleeping in it. According to the website, "ghost-busters, persons with E.S.P. and noted parapsychologists visit, and almost all are drawn to this piece of furniture." ...and so, with that, we came to the home. Now, I perhaps should mention, this was most certainly not an investigation. Although we'd had two contacts about the house, (and oddly enough, neither of them mentioned the crib, but more on that later...) we decided to do what's always a good idea... and that's just take an initial tour. We were very fortunate that we had a wonderful guide, who we could tell was not quite someone who was big on things paranormal, not a complete disbeliever, but not a "fan"... but none the less did talk to us about the crib, the house, and her own lack of experiences there... and her own feelings about the home. We were also fortunate that tagging along was one of our most honoured and respected psychics... which again, I almost hesitate to mention for a few reasons. First is that psychics are really not a "front line" investigative tool for our work... and it's rare that we use them in our investigations... rarer still, as the one's we work with aren't professional psychics and often don't have time to help us out without a lot of advanced notice. Normally I wouldn't have mentioned this extra bit of help save one thing... she truly didn't feel there was anything attached to the crib... nor the home itself. In her view, anything that was there was with the loaned items... well, save the crib again. After leaving the house, myself, Sue, and another investigator were in one car, the psychic, her husband, and another investigator in the other. In our car, the investigator relayed a story of having her arm go "tingly" in two parts of the home... and specified which arm and where it happened (mid-bicep area). The investigator does have professional medical experience and mentioned how this was an odd experience... which is why it stood out to be mentioned. Upon catching up with the other group over coffee (within a half-hour of leaving Bovaird House,) the psychic relayed what she felt in the home... and then mentioned the carpet... which she said was the spirit of an elderly woman who would "hug" people in genuine affection because, indeed, she was proud her rug was displayed and being appreciated. The psychic demonstrated the "hug" on this investigator, who had not shared her experience with this second group, and the psychic's arm went around the investigators shoulders... and her hand grabbed the mid-bicep are of her arm. Was this what caused the "tingling"? Honestly, we don't know... it was a small fluke that we were fortunate enough to have the extra help on an outing that wasn't really an investigation. Either way, if anything is hanging around Bovaird House, by all accounts, it's not only benign... but genuinely friendly. The home is wonderful and interesting... and the grounds and gardens are magnificent. It is a wonderful place to visit for it's history, it's decoration, it's beautiful grounds... and possibly, it's rather friendly and happy ghosts.